Q. What is the "Search Library Catalogue" option in 360 link or link resolver screen for? As a first option, you should select the full-text links available (either Read Article , Browse Journal, or Browse Issue) or Pulldown options under the "Try a Different Source" option. which will usually link you to the article directly or if not to the journal site where you can browse to the article. These links are usually guaranteed to work (if they appear) because they are shown only if the library has access to that particular journal article as 360 link takes into account online coverage by date. How do I check if the full text of journal articles are available? How do I access the full text of journal articles from links obtained from external websites, e.g. Google Scholar or from links given by friends? 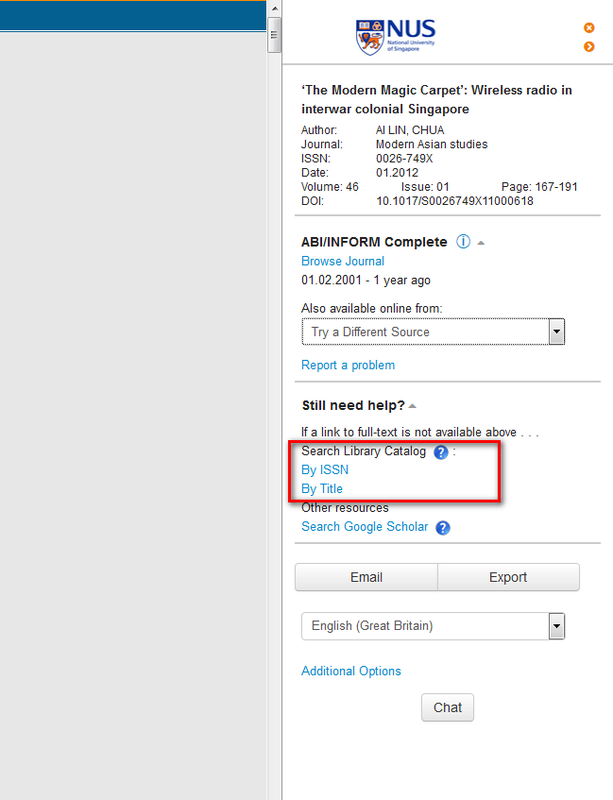 What is the "Search Google Scholar" option in the link resolver screen for?